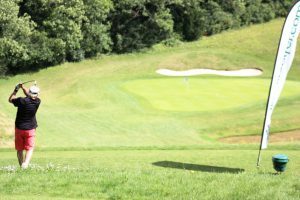 As the players arrived at Farleigh Golf Club for The Social Golfer OPEN 2017 (sponsored by Golf News and Golf Escapes), it was clear from the smiles on the popular website’s members faces this was a day they had been looking forward to. The Social Golfer OPEN was first held in 2011, following the launch of the online golf club in 2010. The event is now in its 7th year. 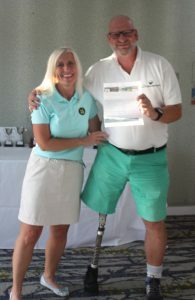 Furthermore, £5 from every entry fee was donated to disabled golf charities. 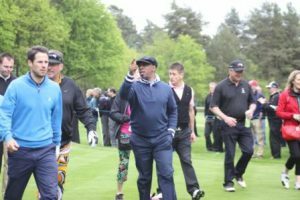 Despite its humble beginnings, the event is now sold out every year, with 70+ golfers travelling from around London and the UK, and with some from as far afield as Botswana attending. 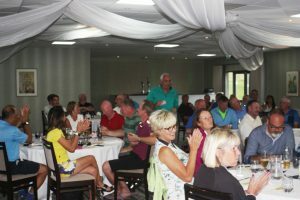 The day’s events comprised, an Individual 18 hole Stableford Competition (Men & Ladies), a much enjoyed ‘Yellow Ball’ team event, run concurrently with the Straightest Drive, 2 x Nearest Pins, Putting competition, The Golf News Guest Trophy, Charity Auction and Raffle also on offer. 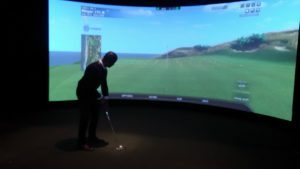 This year, the event also hosted an indoor ‘Nearest Pin’ competition on Farleigh Golf Club’s state of the art golf simulator, with the winner receiving 3 nights half board at the Il Picciolo Etna Golf Resort & Spa, Sicily, Italy, courtesy of Golf Escapes. In addition to the format above, there was also a chance for TSGers to play for “A Trevor”, paying homage to a former member who recently passed away, following a brave fight with Cancer. 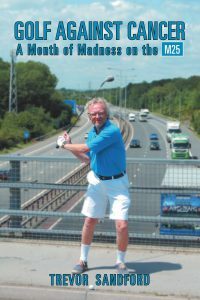 Trevor Sandford was the man behind “A Month of Madness on the M25’, whereby he played a different golf course at 31 different junctions of the M25’s, over 31 days in the month of August 2011 raising money for Cancer Research, following the loss of his Pairs partner to the disease. He later wrote a book about his adventure. Well known for his constant pursuit of the ‘Chip-In-Birdie’, anyone achieving this at future official TSG events , will have their name added to The Trevor Sandford Trophy (donated by TSG members Grge Butler). They will also receive a medal commemorating the moment, which will be known as ‘A Trevor!’ On this particular day, this was achieved by London based member Pete Mayo! 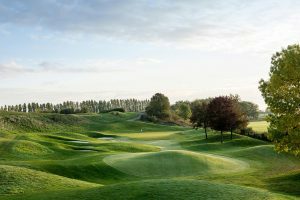 Farleigh GC is part of the Foxhills Collection and is set on 350 acres in the North Surrey Downs and offers a 27 hole Championship golf holes. Set in a valley, the course is well-known for its windy conditions and therefore every shot requires careful consideration. The Social Golfer OPEN was played across the Yellow and Blue courses; the latter having recently seen over £1m of investment, so no surprise that the course played well. This combination boasts a Par 72, (6,212 yards) and was designed by John Jacobs Associates. This combination boasts a Par 72, (6,212 yards) and was designed by John Jacobs Associates. The greens on the day were running at approx. 12 on the stimp-meter meaning3 putts were common. This year’s Men’s winner was Roger Ireland (London) with 43 Pts, 2nd place was Greg Butler (Essex) with 41 Pts and 3rd was Phil Boyd (Kent) 37 Pts. 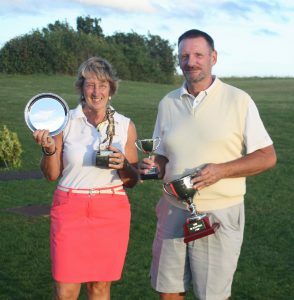 The Women’s Trophy was won by Judy Lilley (Royal Blackheath) with 35 Pts and 2nd place went to African based golfer, Hang Van Den Broeck (Botswana). There was also Nearest Pin & Straightest Drive competitions. Winners included Lee Benson (Hertfordshire), Ron Woodham (Essex), Simon Lacey (Surrey), Damian Benstead (Surrey) with the Putting Competition going to Phil Boyd (Kent). 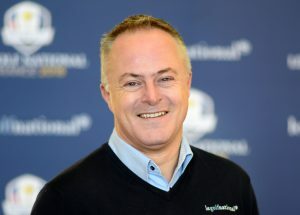 The 3-day golfing in Sicily prize was won by disabled golfer Paul Houghton, after putting his ball to within 5ft of the flag at the world famous 7th hole at Pebble Beach in the three man play-off final. This year’s TSG OPEN championship was no exception. 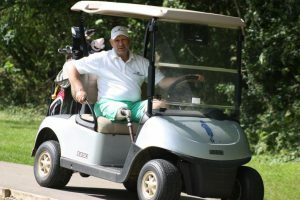 The Social Golfer have always been big advocates in supporting disability golf and this year the members raised over £1k for English Disabled Golfers, Paul Houghton (Disabled Golf Association) and Roger Hurcombe (British Inclusive Golf). These monies will help pay for their travel expenses and buggy hire fees. In addition, both Houghton and Hurcombe will be competing at this year’s Scottish Disabled Open between 21st-24th August 2017 at St. Andrews, wearing The Social Golfer’s team colours. 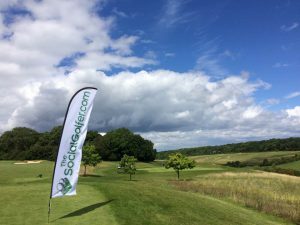 The online golf club and social networking community TheSocialGolfer.com (TSG) has announced that Golf News, the UK’s No.1 Golf Newspaper, will be the official sponsor of this year’s flagship event, The TSG OPEN 2017 at Farleigh Golf Club on 30th July. Now in its 7th year, the event is sold out with 70+ golfers from around London and the Home Counties and with some from as far afield as Botswana attending! 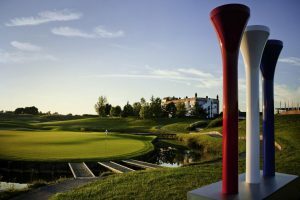 The event is a good “social” opportunity for TSG members to mingle with many of 5k strong UK’s members, with all competing for the now, much coveted Halliwell Cup (donated to the site by Stroke Survivor and British Inclusive Golf Ambassador, Ian Halliwell). Furthermore, £5 from every entry fee donated to disabled golf charities. Golf News will also support the day with donations to the prize table. As Official Media Partner of the day, Golf News will provide media coverage of the event via the Newspaper and it’s social media channels. Meanwhile, The Social Golfer will share core Golf News content in its monthly newsletters across the summer. The day will consist of an Individual 18 hole Stableford Competition (Men & Ladies), a ‘Yellow Ball’ team event, Straightest Drive, 2 x Nearest Pins, The Golf News Guest Trophy, Charity Auction and Raffle. 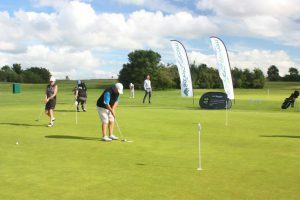 This year, the event will also host an indoor ‘Nearest Pin’ (hosted by Golf Escapes) competition on Farleigh Golf Club’s state of the art golf simulator – adding yet another dimension to the day. 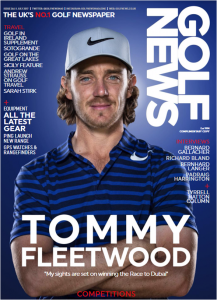 Golf News is the UK’s leading Golf Newspaper boasting over 300,000 monthly readers and Golf News is the UK’s most widely-read free golf publication, and is being read by more UK golfers than ever before, following a significant increase in its distribution channels over the last 12 months. The Social Golfer boasts 9.5k+ members worldwide and was short-listed to be an Official England Golf Partner in 2014, won ‘Best Sports Website’ at the EDA’s in 2015 and was listed as a Top 25 influencer on Twitter in 2016. The deal negotiated between Golf News Publisher Matt Nicholson and TSG Managing Director, Ian Mullins. Over the last few years there have been many initiatives introducing new golf formats to the game, but is all the razzmatazz necessary to get people playing golf? 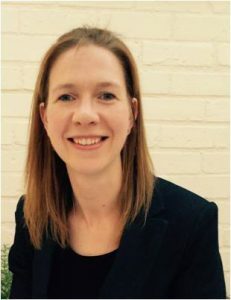 We asked Emma Ballard, Head of Digital at Medi8 Limited, PR agency to American Golf and many other brands. She is also the UK Ambassador for Womens Golf Day. 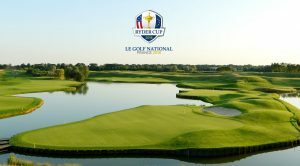 New Golf Formats – Why are they here? In recent times, there has been a real push to get more people, especially women & children, playing the game. With the number of people playing regular golf over the last 10 years declining, governing bodies, golf organisations and professional tours have tried to come up with ways to reach out and get golf back on peoples’ agenda. Back in 2006 when numbers were healthier, you’d find the majority of golfers out on a golf course playing 18, 9 holes or pitch & putt, the driving range and of course, the holiday requirement of a bit of adventure golf! The use of indoor simulators was on the increase and if you lived near the outskirts of London you could make your range sessions much more fun by going to Top Golf. Oh, and on a slight aside, social media was in its infancy. Since then, as the numbers declined, golf has had a go at redefining itself by attempting to alter the format and make the game look more fun and appealing to a younger generation. 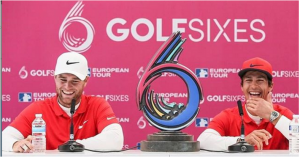 It started at club level with the introduction of PowerPlay Golf, 9 holes with 2 flags, and through other initiatives like SPRINT6GOLF, it culminated in the European Tour’s GolfSixes event this May. 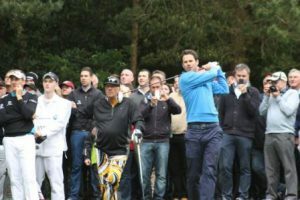 They threw lots of new ideas into the tournament, golf got its version of a Hollywood makeover, creating a lot of buzz and excitement amongst spectators. But what I wonder is whether this is necessary, is this the way forward for golf? Looking at golf today, your options to play are endless, there is everything that I have mentioned that was available back in 2006, but now most ranges are also equipped with some indoor golf facilities. It’s no longer frowned upon to want to play a quick 9 holes, pop-up adventure golf in cities is commonplace and if you don’t fancy hitting a ball you can kick one at the hole in the form of FootGolf. Considering social media again, it’s now an integral part of our lives, a fabulous tool to promote a golf facility with an ability to be able to target a much larger audience and with the likes of TheSocialGolfer.com you never have the problem of finding someone to play with! Golf in itself hasn’t changed, like tennis or badminton, the process and mechanics of hitting a ball is just the same, it’s only the club you are using and the ball you are hitting which have altered over the years due to the vast investment into research and development. So why with so many more playing options than 10 years ago and the basic method of swinging a golf club unchanged is there a need to focus so much on the format of the game? I suggest we don’t mess with the format, the game works perfectly well as it is? Surely we need to focus time and effort at a local level, low cost marketing the wonderful facilities that are available by making use of some, or all, of the low-cost social media channels on offer. By driving people through the door, golf clubs/venues can use the pathways into golf that are already available to get more people back playing and gain new recruits along the way. Essentially golf is fun and has a great social side to it too. With the ability to make it part of family life, a sport that anyone can play and an ever ageing population – it’s time to ditch the razzmatazz and new golf formats and get back to simple ways when golf sold itself! 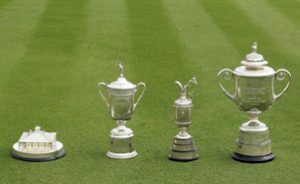 In the third in our series of articles on golf’s Major events, this time we turn our attention to the second oldest event in the golfing diary – The US OPEN! This is then now complemented but The Olympics every four years (from 2016) with the host city supplying the venue. The golfing calendar is on and we have already got past the US Masters in April 2017, with maverick Sergio Garcia holding off Justin Rose in a dramatic and nerve-wracking play-off to emerge as the winner. As the dust settles, everyone is waiting with bated breath for June 12, 2017. That is the day that one of the most prestigious golfing events in the US, the 117th edition of the United States Open Championship, popularly referred to as The US Open, kicks off at Erin Hills in Erin, Wisconsin. The US Open has a rich history spanning 117 years from the time it was held for the first time on October 4, 1895, at Newport Country Club in Newport, Rhode Island. From fielding 10 professionals and one amateur in the day-long competition across 36 holes back then to its present avatar, to be held in Erin Hills, Erin, Wisconsin, this event has come a long way. The 2017 edition will feature 156 players and comes with a prize fund of $12 million and is the first major with a winner’s prize in excess of $2 million. 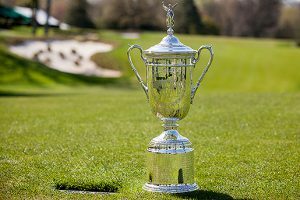 The US Open is the 5th major championship to be held in the state of Wisconsin – it has held 4 other PGA championships earlier apart from the US Amateur Championship in 2011. Erin Hills is the venue of a major for the first time, which means the first thing to look out for is the course itself. 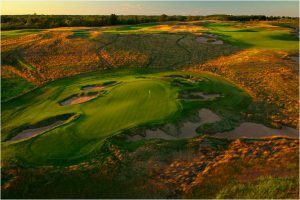 The course at Erin Hills is spread across 650 acres and the huge slopes all across it, together with the unpredictable weather, can make it quite an intimidating place to play at. It can play up to 8100 yards, which makes it longer than Hazeltine National Golf Club where the 1991 edition of the Open was held. This course will also be the first one in US Open history to play as a par-72. Given the dry conditions, it is very likely that we will see some relatively low scores. The 2017 US Open is a showcase event and the focus of the entire media – print, electronic, online and social – is squarely on golf and its players. It is interesting to note that between 2000 and 2016 Americans have won the US Open 8 times. Entering the US Open this year is quite easy – all you need is a 1.4 handicap and a $200 entry fee, after which you have to go through the qualifying grind. This year, 9,485 players have entered the event, the fifth-highest number: the highest was 10,127 in 2014 at Pinehurst. 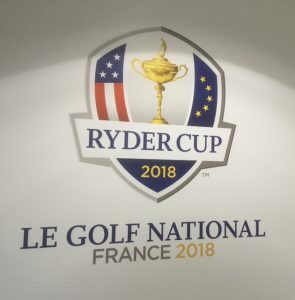 A galaxy of past champions will be part of the playing field this year including; Dustin Johnson, Rory McIlroy, Jordan Spieth, Justin Rose, Ernie Els, Jim Furyk, Angel Cabrera, Graeme McDowell, Lucas Grover, Martin Kaymer, Webb Simpson. Some information on key players at the 2017 US Open is listed below…. Dustin Johnson is a big name to watch out for at the US Open this year, for a number of reasons. The first of course, is the fact that he is the current No.1 ranked player in the world. And then there is the other little detail to consider: he is also the defending champion, having won a grueling battle at the Oakmont Country Club last year. Out of the US Masters in April with a freak back injury, he is now back and in roaring form. He will have an advantage at Erin Hills because of his length and the fact that this is an 8000+-yards course. Currently ranked No.2 in the world, the Irishman went through a drought of titles in 2016. However, he bounced back with wins at the FedEx Cup and also the Tour Championships that year. He is one player who is a constant threat to all others when it comes to winning. He had had the distinction of holding the No.1 ranking for 95 weeks and is a 4-time Major champion. He is also a member of both the US and European PGA Tours. Jordan Spieth is a former No.1 ranking player in the OWGR and a 2-time Major champion. He is the youngest player to win the US Open, after Bobby Jones in 1923, and also the youngest runner-up in Masters history when he came second to Bubba Watson at The Masters in 2014. He has also tied the 72-hole record that had been set by Tiger Woods back in 1997, apart from being the 2015 FedEx Cup Champion. Hideki Matsuyama is a 24-year golfing prodigy from Japan who won four of his last five tournaments last year. This includes the Hero World Challenge and also a WGC event in China. He is a 4-time PGA Tour winner and 8-time Japan Golf Tour winner. His most recent win was at the Waste Management Phoenix Open, where he defended his title against Webb Simpson. Justin Rose is an English professional golfer who plays on the PGA Tour. He is also a member on the European Tour. He was the first Englishman to win a Major since 1996, the year Nick Faldo won. He is also the first Englishman to win the US Open since Tony Jacklin in 1970. Rose has also tasted Olympic glory, having won gold at the men’s individual event in Rio de Janeiro in 2016. 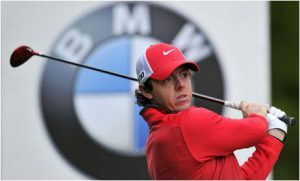 He has been in top form, despite losing out dramatically to Sergio Garcia at the US Masters this year. He is one player to watch out for. Sergio Garcia has been an enigma. He has played on the PGA as well as the European Tour on the PGA. A brilliant golfer who had a stunning 0 wins when it came to the majors, he broke the jinx at Augusta this year by winning the US Masters. He defeated Justin Rose in dramatic fashion in a sudden-death playoff, pulling off the win at the first hole. Of course any player could win the trophy, but we think these players above are the ones to watch out for. Betting on golf has exploded in recent times because of easy access to the game – be it watching it on TV or following online – and also the opinions of golfing pundits. Another major reason for this explosion is the wealth of licensed betting sites available to followers of the game and even to casual punters. Millions of pounds are wagered almost daily at the various golfing events around the world, and the money only grows bigger when the event is something like the US Open. The odds-on favourite of course is the No.1 ranked player in the world currently, Dustin Johnson; every sportsbook has seen money wagered on him. Leading bookmaker William Hill has the odds listed at 6/1 for Johnson. There are rank outsiders as per the bookmakers too. These include Billy Horschel, Jason Dufner, Scott Piercy and Marc Leishman, all at 100/1, while Daniel Summerhays brings up the rear at 125/1. So as 12th June approaches, you could get incredibly busy if you are into golf and also making some good money placing the right bets. There are lots of guidelines that can help you decide whom you want to bet on, including form books, the official player profiles at the USPGA website and more. However, regardless of who wins, this year’s winner is guaranteed the distinction of being the one with the biggest US Open paycheck ever! Is technology good for golf? So it comes as no surprise that companies are looking to the digital landscape to release new innovative golf-themed apps, games and training tools to sell to such a vast market. And these products aren’t just aimed at novice golfers, some are targeting at professional players. Unlike other sports, golf (as you know) is a non-contact sport and for the most part isn’t as physically demanding as say, rugby or football. However, while it may not be as demanding on the body, the margin for error on a golf course is psychologically draining, meaning you need to be on top of your game at all times. If you’re a beginner you can consider taking golf lessons to improve your game or venture to the driving range as much as possible to improve your ball striking. But if you want to sharpen your technique without having the luxury of a course professional at your beck and call, alternatively you cab use many of the new digital aids now available on the market. In the digital age, as well as mobile apps that can support players in terms of technique and collect useful data and stats on things such as swing speeds, impact angle. One of the most impressive pieces of technology we have seen to date has to be The Robot, recently installed in state of the art golf studio in Camberley Surrey. However, at over £150k per unit this will be out of most golfer budget. SkyPro is an app which focuses on one important skill – a player’s golf swing. Combined with a small device (the size of a thumb drive) that can be attached to your golf club, SkyPro analyses your swing and identifies faults which you can then fix and/or improve upon. 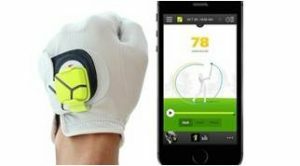 This nifty little gadget will cost you around £200 (App is free) and is reasonably priced considering that a Golf Coach will probably cost you around £40+ per hour. SkyPro has been around for a couple of years now, with the app getting regular updates. One of its main supporters is Hank Haney, the former coach of Tiger Woods, who stated on twitter that SkyPro is revolutionising the way teachers help golfers. SkyPro allows you to be your own coach if you’re unable to get professional guidance. Unlike other golf gadgets, Zepp Golf 2 doesn’t attach to your club – instead, it fits on your glove. Utilising a synchronous connection with your mobile through Bluetooth, the app can render your movements in a series of 3D still shots or a video, which you can then view on your phone giving you instantaneous data to work with. The makers have specified the six mechanics measured by the device, namely: club speed, club plane, hand plane, hand speed, backswing position and tempo. You also have the option to follow a preset required number of swings per week and get a detailed report from the app afterwards, complete with tips for further enhancing your performance. The device retails at around £130, while the app is free. Hole19 is a different kind of tool because it’s main function is to help golfers familiarise themselves with around 40,000 golf courses, which is roughly 95% of the world’s courses. But Hole19 can do so much more, as it can assist players in gathering course data such as GPS yardages, hole map imagery, stat tracking and other key statistics which will aid players in making quick decisions and adjustments – while playing. The free app is also compatible with smart watches, which brings more convenience to players especially in the middle of a game. In 2016, Hole19 acquired more than 800,000 active users from all over the world. Having these three trainer aids in your arsenal (or in today’s parlance your smartphone) is a good start, but there are plenty of other digital tools that can help develop your golf skills. With the continuous development of mobile technology, there is sure to be more apps and devices in the coming 12 months that will break new ground in helping golfers hone their skills. However, there has also been some evolution in the way we play golf away from the course…. 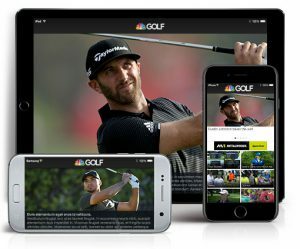 For example, Phone Arena revealed that the World Golf Tour Mobile app provide updates with the latest Pro tournaments and now includes the 2016 Virtual US Open in its database, mainly due to requests from players of varying abilities. 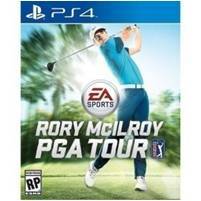 We’ve also witnessed the evolution of PGA Golf on the PlayStation, originally made famous by Tiger but now endorsed by Rory McIlroy on the cover. Another notable game that has been released in honour of the sport is the slot game Golden Tour, which was brought to the market by online gaming platform Betfair. While the last couple of examples of the sport’s popularity in the gaming world cannot help you improve your golf swing, they certainly represent golf’s popularity as the sport breaks new ground in digital entertainment, giving fans alternative options to pursue their love for the game away from their local course. We can only speculate where this form of the golf industry go next but one thing for sure is that whether it be a Swing App, a GPS Tool or a gaming activity – technology is set to develop more and quicker than ever before over the next few years…. The best thing about digital age is you longer have any excuses for improving your game or indeed for enjoying the game more than ever before. 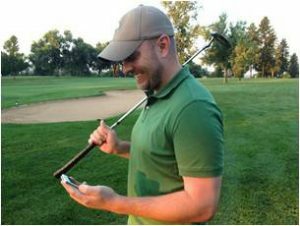 Tags: Golf Apps, Golf Games, Golf Technology, Is technology good for golf? 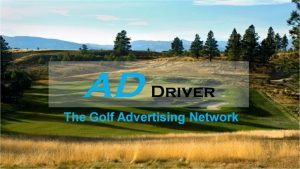 As the growth of online readership among magazines and websites continues to grow unabated, step-forward newly launched golf advertising network called AD Driver Limited. Backed by seven well-established golf publishers including Fyne Associates (Publishers of Golf South Magazine, Golf North Magazine) Yourcaddy Magazine, Golf Deals Group, Golf Assessor Online, TheSocialGolfer.com and IndepdentGolfReviews.com, the new Ad network will be able to deliver over 5.2m Ad impressions per month to the golf industry. The AD Driver golf advertising network covers the majority of the UK’s golﬁng landscape through both national and regional web traﬃc. The mix of golf publisher websites deliver regular and engaged traﬃc at key locations throughout England, Scotland, Wales and Northern Ireland. AD Driver publishers can also oﬀer strong audiences across the US, Germany and the Nordics. AD Driver golf advertising network even allows you to advertise your club or brand by town, postcode and city ONLY!